Added fat is something of a pet-peeve of mine when it comes to vegan and vegetarian cooking. I am neither a vegan nor a vegetarian, but like many people, I am trying to dedicate more and more of my plate to vegetables for both health and environmental reasons. But it’s a little easy to end up with meat-free-fatigue when you keep running across mundane dishes that simple subtract meat from the equation and expect fantastic results. We’ve all had one of these dishes before – you finish off a meal only to find yourself and trying to convince yourself you feel full and you’ve enjoyed your meal, all the while trying not to think about ordering a cheeseburger. On the other hand, those of us trying to find satisfying meat-free meals often end up neglecting the ‘veg’ in vegetarian, instead going a little heavy-handed with the added fat and grains. Vegetarian noodle dishes are often one of the worst offenders in this category – they take vegetables and simply drown them in cream and cheese. Don’t get me wrong – I love cream and cheese and dairy in general (probably more than I should), but adding peas to fettuccine alfredo hardly makes it a vegetable dish. Vegan dishes are often better – after all, cream isn’t an option – but it’s still a little too easy to try to overpower a dish with sauces or oils. I’m not advocating for the banishment of sauce (I’m not a monster), but I do think that it’s worth seeking out new ways to let vegetables actually star in a dish. This might seem a more daunting task, and frankly, it is harder. It doesn’t take a lot of culinary chops to smother a vegetable in cheese and call it a day (a delicious, delicious day). I’m not trying to sound elitist here – after all, this is my recipe for broccoli cheddar soup, and you can bet there’s plenty of dairy going on there. But it’s worth the effort to approach a vegetable component while asking yourself, “What does this taste like? What will emphasize, balance, and highlight the flavour, rather than bury it?” It isn’t as easy, but in the end, I think the result is more rewarding. Not only do you end up with a (generally) healthier dish, you end up with food that tastes… well, like it should. Vegetables have slid into such an underwhelming accessory role on the average North American plate, we seem to be forgetting that they do in fact taste good, and can anchor meals on their own. This brings me to today’s star, bok choy. 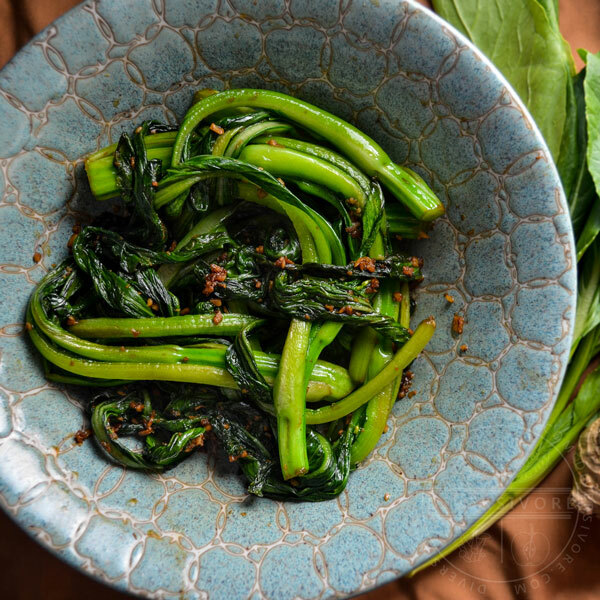 Bok choy has a wonderful property that makes it ideal for vegetarian, vegan, and dairy-free cooking – it becomes creamy when it cooks. That’s not to say that it liquefies or even makes a sauce, but the cooked stalks have an undeniably creamy, smooth texture, unlike any other vegetable I’ve come across. It’s a rather welcome characteristic, especially given the aforementioned practice of drowning vegetables in added fat in order to achieve a similar effect. From a flavour perspective, it’s slightly sweet, ‘green,’ and very easy to work with. In this dish, it partners with lemon and garlic – two ingredients that amp up the flavour of the dish without overpowering it. Because it uses soy, sesame, and ginger sparingly, it strikes a nice balance between two of the more common extremes in Chinese vegetarian/vegan cooking (bland or drowning in sauce). 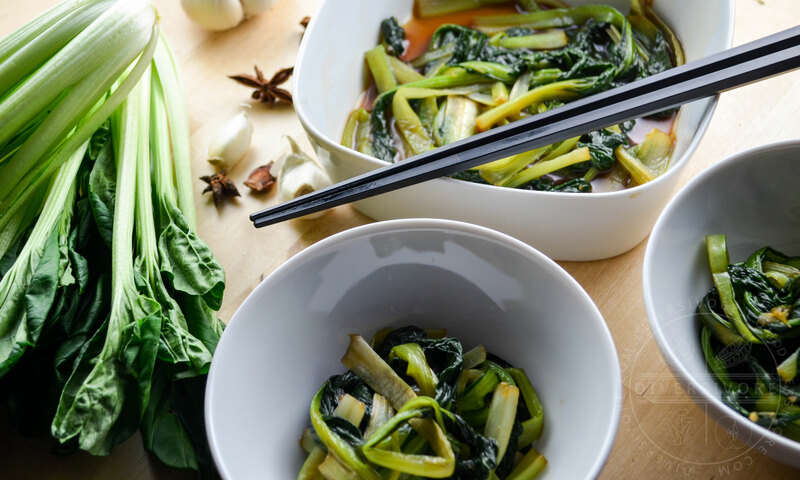 Bok choy is really versatile and delightful, and it gets a chance to shine here. But even if this dish isn’t your style, I hope that you’ll do something the next time you start to cook with vegetables; I hope you’ll let the spotlight actually shine on them. Pause for a moment and taste a leaf, stalk, stem, or root. Taste it raw if you can. Taste it once it’s been cooked, but before you add any sauces or seasonings to see how the flavour has transformed with heat. Ask yourself what it tastes like – and what you’d like to do to improve upon and accent that flavour, rather than letting it disappear in the background. Black sesame noodles have a pale charcoal colour and a pleasantly mild sesame flavour. Try looking for them as Asian grocery stores, but be sure to find a brand without a lot of additives or salt. 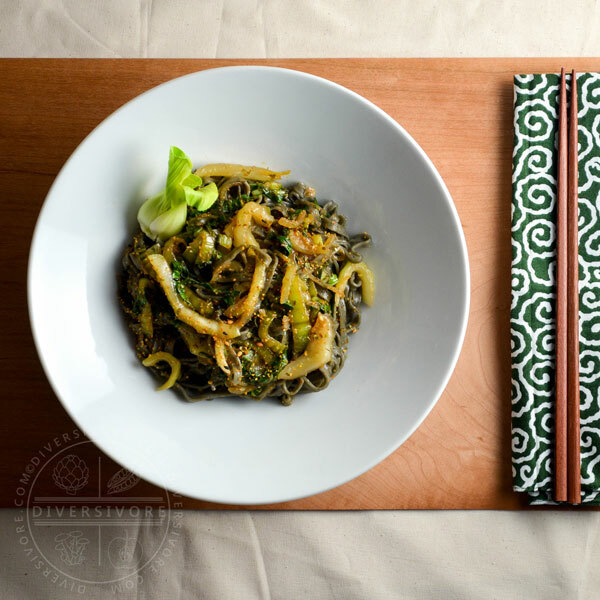 If you can’t find black sesame noodles, you can use any simple wheat-flour Chinese noodle, or even linguine. Ginger juice can be made by grating ginger and squeezing the resulting puree. You’ll need about 2 tsp of grated ginger to yield 1 tsp of ginger juice. 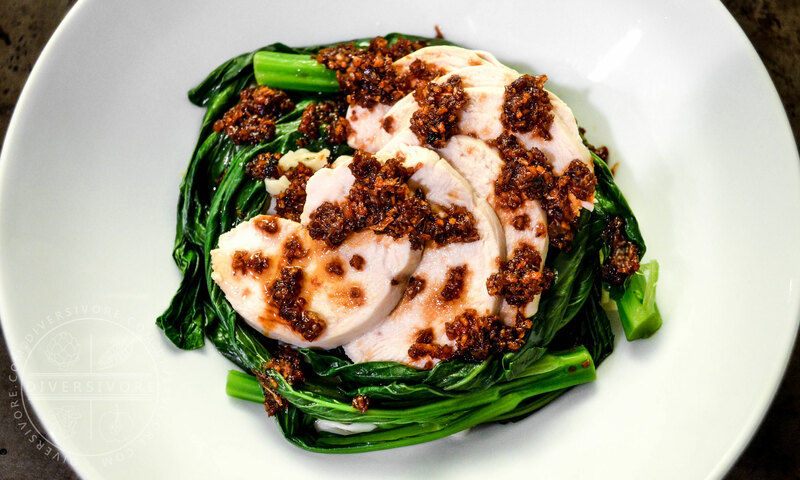 You can use Shanghai or regular bok choy for this dish. I used Shanghai bok choy, as it adds a bit more of the green look to the dish, but the taste won’t really differ in any case. If you do want to add anything to this dish, a little protein would go a long way. In keeping with the vegan theme, peanuts or tofu puffs would be my top-two choices, but a mild meat like Chicken or a little minced pork would work too. A little heat in the form of chili sauce or spicy bean paste (doubanjiang) would be nice too, and would work well with the garlic and lemon. GOOD NEWS:Thanks to the amazingly healthy veggies in this dish, it’s low in calories, fat, and sodium while managing to be extremely nutrient dense. It’s tough to make noodles any healthier. BAD NEWS:There’s no substantial source of protein, so consider serving this alongside something protein-rich, like a Chinese braised meat, eggs, or tofu. Combine the sauce ingredients and set them aside. Bring a pot of lightly salted water to a boil for the noodles while you continue with the stir frying steps. Once the water is boiling, cook the noodles until al dente, then drain and set aside. Note that you can cook the noodles while you follow the remaining steps, but try to time things carefully - you want the noodles to be cooked and drained before you finish stir frying. Separate the bok choy stalks from the base of the plant and trim away the rough edge at the bottom. Separate the thick stalks from the leafy green portions, then slice both into thin strips. Heat a wok over very high heat for about 1 minute. Add the oil and heat until faint wisps of smoke begin to appear. Add the onions to the wok and stir fry for about 30 seconds. Add the garlic and teaspoon of soy sauce and stir fry until the onions are well cooked, about 2 minutes. Add the chopped bok choy stalks and the lemon zest and stir until the stalks are soft, about 2 more minutes. Add the bok choy greens and stir fry for about 30 seconds, or until the leaves are a deep jade green. Pour the sauce over the vegetables and mix thoroughly. Toss the cooked noodles in with the vegetables and combine briefly over heat. Transfer everything to individual bowls or to a large serving dish. Garnish with shichimi togarashi, chili flakes, sesame seeds, or any other garnishes you might like, and serve immediately. Black sesame noodles have a pale charcoal colour and a pleasantly mild sesame flavour. Try looking for them as Asian grocery stores, but be sure to find a brand without a lot of additives or salt. If you can't find black sesame noodles, you can use any simple wheat-flour Chinese noodle, or even linguine. Ginger juice can be made by grating ginger and squeezing the resulting puree. You'll need about 2 tsp of grated ginger to yield 1 tsp of ginger juice. This sounds delicious, thanks for sharing! Your blog and your photography is stunning by the way! Big thumbs up. Aww, thanks Hannah! I love photography, but it’s always a little intimidating to try something new, and food photography definitely poses new (and ongoing) challenges. I’m really glad that you’re enjoying the pictures and the site! Love the way you prepared bok choy here as part of the dish vs. just stir fried on the side (which is what I usually do). It’s kinda hard to eat the way I make it and this is giving me some great ideas! Anddd…black sesame noodles? Where have they been all my life? Thanks Sofia! 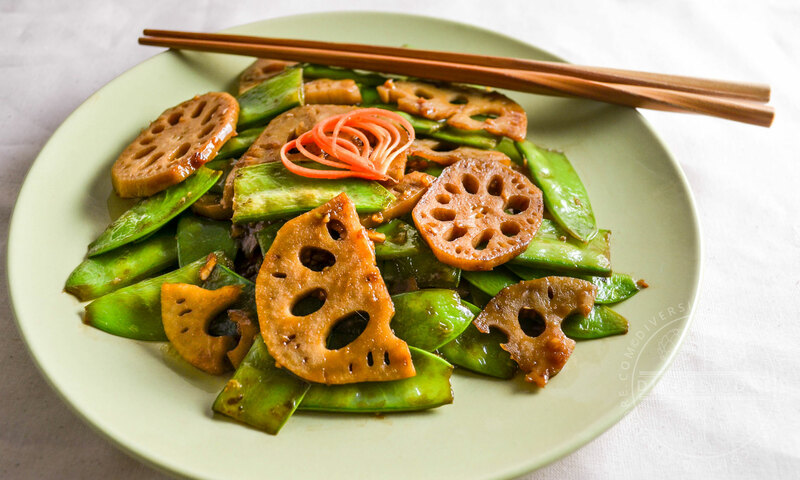 I totally know what you mean – I have a go-to method of working with a lot of Chinese greens that simply involves stir-frying with oyster sauce or soy sauce and garlic. It’s really good, but I wanted to get out of my comfort zone and think up some dishes that really incorporated vegetables this month. And yeah, the noodles are awwwwwwesome… it’s funny though, the ones I bought all came with these little ‘flavour packages’ (just a mixture of soy bean and sesame oil), designed to be poured over top so that you can eat the noodles as a meal. Obviously I didn’t use them, and now I have all of these little foil packages kicking around. Even with that little bit of waste involved, they were still quite cheap. Thanks Janice! It really comes together in a snap, which is awesome. I’m often cooking with one of my kids either in my arms or asking me to come play, so fast, healthy meals are a welcome addition to my day! As for the noodles, I found them at a Taiwanese store called Guo Hua. I hope you can find them where you are, as they really do have a nice flavour. Thanks Alanna! I was quite pleased with the way this turned out. Even though I’m focusing on vegetarian and vegan food this month, one of the great things about Chinese dishes is how often they work with only very small amounts of meat. A few slices of something like char siu (BBQ park) would be more than enough. Your and your food is beautiful, so I’m glad you’re loving the pictures! When I started out I got a little nervous seeing some of the great food photography that’s out there, so I’m really pleased that people are enjoying it. The flavours of that bok choy with those noodles sound fantastic and it’s so healthy which I love. Thanks Mel! It’s nice to have a guilt-free noodle dish.